A corrupted but honorable merge of The Tree of Life and the collective work of David Lynch would lead to an aesthetic that could almost adequately describe the one presented Shane Carruth’s Upstream Color. Much like Malick’s existentialism rush, it digs into insurmountable philosophical musings, and the Lynch gene is its bizarre imagery and multilayered sound design – one of the best I’ve ever heard. It’s a curious thinkpiece, original in such an overwhelming way that the fact that I even dared compare it to anything else would suggest a minimal understanding of the movie. Customarily, a review spends the two paragraphs after the lead describing the first act or so of the story, in order to show the reader if he or she would like it, regardless of what the reviewer thought. I would do that here, if I could understand the plot. There is one, there is something driving the characters, but it’s never explicitly revealed what it is – never revealing the details behind something is definitely the driving force behind the movie, written by, directed by, edited by, shot by, composed by, co-produced by, and starring Carruth. There’s a hypnotic nature to the elements at hand; an idiosyncrasy, from a pig farmer (Andrew Sensening) also dabbling in medical operations and sound editing like some sort of DJ-Foley mix, a surrealist first act where events start at a woman named Kris (Amy Seimetz) being kidnapped and experiencing events ranging from copying passages of Walden to waking up worms crawling under her skin. There is some connection, although it isn’t altogether certain what it is, between that and a following narrative, where against the backdrop of the relationship between Kris and a man named Jeff (Carruth) as they piece together that they have both been victims of whatever happened. First off, you’ll need an appreciation (or at least a tolerance) of the stereotypical textbook definition of “art house”. As I reiterate for the thousandth time, this is an exceptionally weird movie. I did not know Carruth’s character’s name was Jeff until the end credits. Recurring themes (pigs, matching shots in both urban and outdoors settings, characters doing just plain odd things) will be presented to you, and it is your job to selectively and personally interpret them. Next, you’ll need the recognition that you are going to have to (and will want to, hopefully) rewatch this movie. Multiple times. The review you see here is not a document of my final thoughts on Upstream Color. Not by a mile. This might not even be the last article I specifically devote to it. This screams out as a film that requires further time dedicated to it in order to give the viewer the experiences it requests. I imagine this was an elementary foundation on which Carruth developed this project. Lastly, before you watch Upstream Color, know that unless you have a very solid cinematic constitution, you will most likely have moments, no matter how fleeting, of undeniable frustration with this film’s 96 minutes. It’s open-ended and transcendent style can really work for some, but will break others. Tread carefully. Okay, that’s done. I’m not sure whether I’m at a point where I can say much more. What I do know for sure is that Upstream Color is one of the most intriguing projects I’ve ever seen, never anything less than entirely absorbing. The acting, even when no words are being said, is compelling. The sound is nearly telling of what is important when: Towards the start, where characters are being manipulated, show powerlessness by making dialogue tinny and sometimes near-inaudible, focusing more on nature and related sounds. As the film progresses, and characters and interactions become vital, sound levels become more normal. The visuals, often washed out and in unassuming colors, elevates style, brimming with mystery and elusive concepts. Shane Carruth’s second film has displayed the impression that a grasp on an idea is not exclusively the backdrop of appreciating a piece of work. The three star rating here is mainly ceremonial and done by self-set necessity, showing a crude symbol of my personal opinion (frustrating, but very, very, very immersive). Never before have I been so quick to recommend a movie I have had such a minimal grasp on. 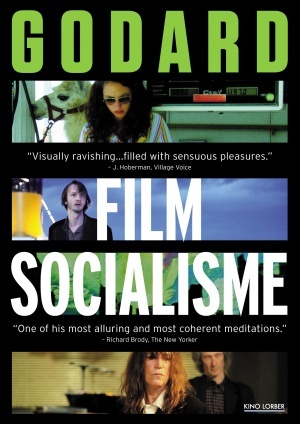 I, like many, regard Jean-Luc Godard as an authority on cinema, and for good reason. A filmmaker for over 50 years, his early work gives us some of the building blocks of contemporary filmmaking, as did his French New Wave colleagues. That is why I’m especially angry at Film Socialisme, his latest feature effort. It is among the most inconsequentially time wasting, pretentious, and pointless movies I have ever seen. Had someone like Godard not have been involved, I imagine it would have no supporters at all, instead of the devoted few that exist. But there are supporters, so more power to them, I guess. Or most of them. More on that later. Film Socialisme is a film without a plot – on purpose. It is divided into three acts, or “symphonies”, one on a cruise ship, one on land featuring a family, and one simply detailing the various wonders of the world. Most scenes within said movements are unrelated to each other. Dialogue is nearly entirely in French, and is compensated with three word subtitles following a line, “Navajo English”, Godard calls it (either he’s referencing the World War II Native American code talkers, or the way they talk in old Westerns. Both are equally viable, but I have a feeling that it’s probably not even either of the two). (Example: what I’ve written in this paragraph so far might be: “noplot foreign three”, or something to that effect. Words are frequently combined, hence “noplot”.) Based on the subtitles, most of the conversations are about Europe, race, history, heritage, war, and politics (hence: “socialisme/socialism”). There is nothing I want more than for a fluent French speaker to watch this and tell me what the freaking thing was about. There are some profound moments to be seen – a softly spoken conversation with “Pathetique” by Beethoven tinkering in the background on a piano is one that sticks in my head, but everything else is an incoherent (on purpose) mess (on purpose), alienating the stupid Americans (on purpose). 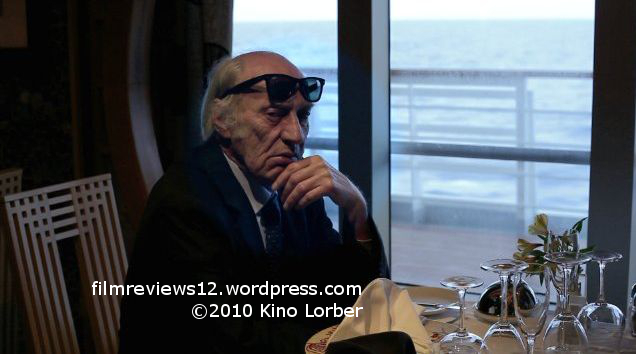 And you have to give Godard at least minimal credit on the camera – the segments on a cruise ship are parts grainy closed-circuit video, high definition digital video, and some godforsaken footage, grainy and abrasive, shot on a bad cell phone. The first part of the film has a documentary vibe to it, where the dissolution of independence is found by herds of tourists flocking off to every pandering subject and pastime. A refrain among some defenders of Film Socialisme is that the very objective of the film is up to the viewer, and those who dismiss it are conformist and follow the masses, like the above mentioned tourists. If anything, the tourists represent them, the aggressive Godard admirers – those trying to sway anyone who comes to an individual opinion on things like this, attempting to pull them over to their side and living out a scene on a dance floor, where 5 year olds run around following the lights. Their very argument is hypocritical, telling them what they are supposed to experience after saying that everyone will experience something different. Think Godard wouldn’t alienate his own obsessive-level devotees? It’s gotten to the point where I wouldn’t put anything past him. It’s not hypocritical on my part to point them out; I have nothing against those who like the movie in general, but the behavior of a select few must be condemned. A review should read as a personal reflection and record of what the reviewer felt while examining the work critiqued, and in writing this, I convey the message that I felt the work of an aging man, while rightfully complaining about the things I believe he was complaining about, doing so in a wasteful and inaccessible way. This is a one star review, yet I still call for you to watch it if you are interested, and draw your own conclusions. I won’t deny that’s what it was made for.